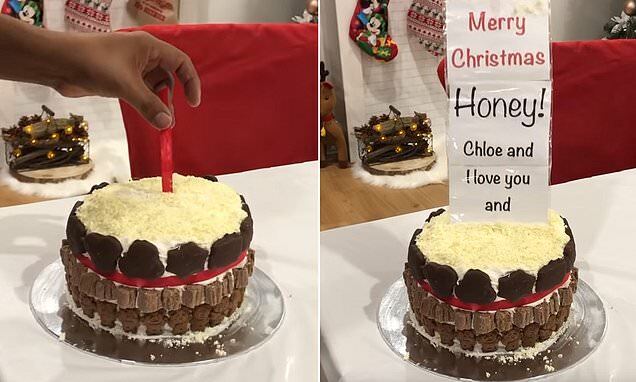 A woman's Christmas themed cake hack has gone viral online - and it only cost her $15 to make. The mother-of-one from Australia was her husband's Secret Santa and so purchased a $4.40 mudcake from Coles as well as a $12 cheesecake. 'This took me about six hours to make and I was up at 3am doing it,' the woman said in a Facebook post. 'It's not the prettiest but my husband absolutely loved it and was sooooo shocked!,' she added. In the space of 11 hours her post received a thousand reacts and hundreds of comments from people who were impressed with her idea, with some saying it was the 'best cake of the year'. Many people said they thought the idea was 'beautiful' and 'so sweet'. 'I love this! Much better and more meaningful than the money thanks for sharing,' one person commented. The busy mother also shared a video to YouTube of how she made the cake so other people can follow suit.